The Toyger is a man-made breed created by crossing a Bengal with a domestic mackerel tabby to create the characteristic tiger stripes. They are highly intelligent, energetic, playful and get along well with pets and children. Toygers are still quite rare, hopefully, this will change in the future. The name Toyger is a combination of toy and tiger, which aptly describes this cat to a tee. The Toyger is a relatively new man-made breed which came about when in the 1980’s, Bengal breeder Judy Sugden of EEYAAS Cattery (daughter of Jean Mill, the founder of the Bengal breed) crossed a striped domestic shorthair with a Bengal to produce a stunning cat with a striped appearance. This came about when she noticed two small spots of tabby markings on the temple of one of her cats, named “Millwood Sharp Shooter”. Realising this could be the beginnings of developing a breed with circular tiger markings on the head. Other breeders came on board and in the early 1993 TICA accepted the breed for registration only and gave them new breed status in 2000. The breed received full recognition in 2007. 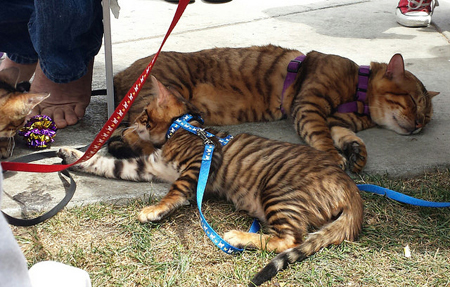 The breed is still in development and breeders are still working to create a breed that resembles a miniature tiger. 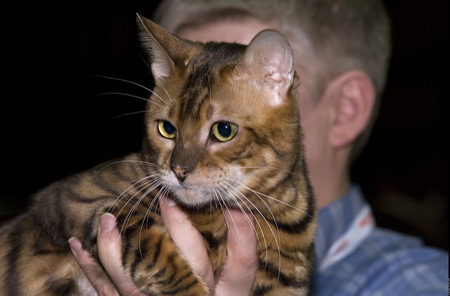 Computer imaging is used to help breeders determine exactly the type the Toyger should be. The Toyger is a stunning cat with a short, sleek glittered (gold tipped hairs) pelt, like their Bengal cousins. Darker stripes are more desirable on a pumpkin orange background. They are a medium to large sized cat with large bones and a muscular body. The head is medium-sized, with a heart-shaped face, small, rounded ears that are set wide apart. Round, small eyes, with gentle hooding on the upper inside. The muzzle is strong and broad, nose long and broad, widening towards the end. The Toyger is one of the most intelligent breeds of cat who are easy to leash train and love to play fetch. They are an extremely energetic breed of cat, love to be up high. Like their Bengal cousins, many Toygers are love water and are easy to bathe. They love to be around people and get along with other animals and children and make a fantastic family pet.